One night in December 1950, Harry Willcock, the 54-year-old manager of a dry cleaning firm and prospective parliamentary Liberal candidate, was stopped by two police officers as he was driving home to Barnet. PC Harold Muckle asked Willcock for his driving licence, road fund licence, insurance certificate and his identity card. Willcock refused to produce his identity card as a matter of principle. Constable Muckle handed him a form demanding that he should produce his ID card at Finchley police station within two days. Willcock replied that he would not produce it at any police station and refused to accept the form. When Muckle then tried to press the form on him, Willcock threw it on the pavement and drove away. As a result of this incident, Willcock was summoned to appear before local magistrates. In court, he argued that the emergency wartime legislation authorising ID cards was no longer valid since the emergency no longer existed. The Middlesex magistrates said the National Registration Act requiring ID cards was still in force hence they had to find him guilty. However, they were so impressed by Willcock’s case that they gave him an absolute discharge. Neither Parliament nor the courts ever had an opportunity to pronounce judgement on the Labour government’s decision to perpetuate emergency wartime regulations on control of information far into peacetime. But there is a close parallel in the wartime regulation on National Identity Cards that was indeed later subjected to scrutiny in the High Court and so provides some useful insights on the question of whether the Attlee government acted properly or improperly. ID cards were first introduced in Britain in 1915, during the First World War. The government’s aim was to get an accurate figure for the number of men that would be available for conscription, together with the name and address details of men of military service age on a national register, so that they could be contacted and called up as and when necessary. There were some exceptions to this view – at least in the press. The normally left-leaning News Chronicle, for example, suddenly developed a nostalgia for ID cards in 1919 and bemoaned the ‘cherished’ cards having been forgotten about. However, the editor of the Chronicle was in a minority and his appeal failed to wake up those responsible in Whitehall – no-one was willing to spend time and money exhuming the cards from the pit of neglect into which they had fallen. When the Second World War began in 1939, the government had exactly the same need – to know how many men were available for conscription and where to contact them for call up, so a National Registration scheme, complete with ID cards, was again introduced as an emergency regulation. The national registration scheme was implemented by activating early the arrangements that Vivian’s department had already made for conducting the regular census, due in 1941. The regulations were the same and the method of collecting family information on the doorstep was the same – except that enumerators would now issue ID cards as well as taking details. During the war, an ID card was necessary for every man, woman and child to get ration books and coupons for food, clothing, and petrol. When spy-mania gripped the country during the ‘phoney war’, it became common for officials of all kinds to demand to see people’s ID cards. The National Registration Act said that ‘a constable in uniform, or any person authorised for the purpose under the said regulations,’ could demand production of the ID card, either there and then or at the local police station’, usually within 48 hours. In the dark days of the blitz and the early years of the war, having an official ID card may well have seemed a benefit and even a comfort for many people – a tangible symbol of belonging, and positive proof of being a patriotic citizen. Few people objected to being asked to produce their ID card initially – especially as it seemed a guarantee that everyone was in the same boat, that the rationing regulations were being observed by all. Already what had begun as a National Registration ID scheme was being seen by the national government as a means of control as well as identification. As early as 1942, Home Secretary Herbert Morrison asked a committee, chaired by Registrar-General Sylvanus Vivian to consider the arrangements needed for preparation of a new register of electors and possible redistribution of parliamentary seats after the war. When Vivian reported, he argued that a National Register would continue to be needed in peacetime because there would be a number of national organisations interlocking with one another and between which personal information would be exchanged. It would be the National Register that held together the post-war system. When the war ended, many emergency wartime regulations lapsed . 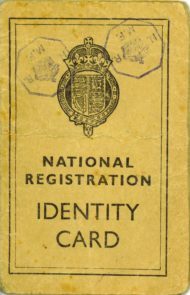 However, shortages of food, clothing and petrol continued for some years into peace-time, so it was necessary for the new government to allow the legislation relating to ID cards, The National Registration Act of 1939, to remain on the statute books until such time as supply returned to normal and rationing was ended. But extending the requirement of ID Cards for rationing purposes, also extended the security and surveillance aspects of the regulations. You needed your card to buy sugar and eggs at your local grocer’s shop. But you also still had to carry your card at all times and to produce it on demand from a policeman or other official simply to prove your identity. There was no public explanation of why this measure was considered necessary in peacetime, just as there was no explanation of why some ministers considered it necessary to preserve functions similar to those of the Ministry Of Information in peacetime. The reason that the imposition of ID cards in 1915, and again in 1939, was potentially a highly controversial topic was because it was a measure that had long been considered deeply intrusive to British minds. Many other countries had introduced ID cards – Germany in 1938 and France in 1940, for example – and these cards remained in use after the war. Their respective populations seemed to have taken the measure in their stride without complaint. But, an Englishman’s home is his castle. The British are not used to being numbered and processed. However, by the time the war ended, Vivian’s prediction had already become fact. Numerous organisations were using people’s National Registration numbers as part of their own systems – such as military national service, police and national security. Moreover, rationing of food and clothing – one of the most important functions of the Register – was to continue for some years into peace time. The incoming Labour government therefore decided to retain ID cards. Once again, the Attlee government dodged the issue and refused to end ID cards. However, in 1950 the Labour Government established a committee, chaired by Sir Nicholas de Villiers – a deputy secretary at the Ministry of Works – to enquire into the future of National Registration from the point of view of administration. The committee was quite clear that in peacetime the continuation of registration and identity cards was politically undesirable. Even with the de Villiers recommendations before it, the government still refused to act. In the end it was the single militant citizen, Harry Willcock, who forced the issue. Willcock had argued in court that the emergency wartime legislation authorising ID cards was no longer valid since the emergency no longer existed. The Middlesex magistrates said the National Registration Act requiring ID cards was still in force hence they had to find him guilty. However, they clearly agreed with him in principle because they gave him an absolute discharge. although the police may have powers, it does not follow that they ought to exercise them on all occasions or as a matter of routine. From what we have been told by counsel for the respondent, it is obvious that the police now, as a matter of routine, demand the production of national registration identity cards whenever they stop or interrogate a motorist for whatever cause. Of course, if they are looking for a stolen car or have reason to believe that a particular motorist is engaged in committing a crime, that is one thing, but to demand a national registration identity card from all and sundry, for instance, a lady who may leave her car outside a shop longer than she should, or some trivial matter of that sort, is wholly unreasonable. This Act was passed for security purposes and not for the purposes for which, apparently, it is now sought to be used. To use Acts of Parliament, passed for particular purposes during the war, in times when the war is past, except that technically a state of war exists, tends to turn law-abiding subjects into law-breakers, which is a most undesirable state of affairs. Further, in this country we have always prided ourselves on the good feeling that exists between the police and the public, and such action tends to make the people resentful of the acts of the police and inclines them to obstruct the police instead of to assist them. Many newspapers, including the Manchester Guardian, the Scotsman, and the News of the World, applauded Lord Goddard’s remarks. Yet still the Cabinet did nothing. Only four months later, the Conservatives won the general election, in October 1951, and Winston Churchill returned to Downing Street as Prime Minister. On February 21, 1952 the Minister for Health, Harry Crookshank (who had also vigorously opposed the MOI) was greeted with cheers from fellow MPs when he told the House of Commons that national ID cards were to be scrapped and that the National Registration Act was to be removed from the statute books. The end of the wartime emergency was finally declared in May. It is, of course, especially interesting to note the basis on which the Lord Chief Justice handed down his findings. It is acceptable for a government to pass emergency regulations for security purposes in time of war. It is not acceptable for the government to continue to use such wartime regulations, once the emergency has passed and national security is no longer an issue. A further point to notice about ID cards is that the Attlee government was perfectly willing to allow wartime restrictions and regulations to persist in peace-time – even if it meant that law-abiding citizens were arrested and fined – simply because it was more convenient for them to govern with the regulations in place than without them. Having reached this conclusion regarding a National ID Registration scheme, the Labour government also reached the same conclusion about using wartime propaganda methods on their own citizens – it made the business of gaining the consent of the people more convenient.